Los Angeles chef Phillip Frankland Lee offers family-style dishes of American fare at Montecito Inn. Open for Dinner nightly 5 p.m.-10 p.m., Brunch Sat.-Sun. 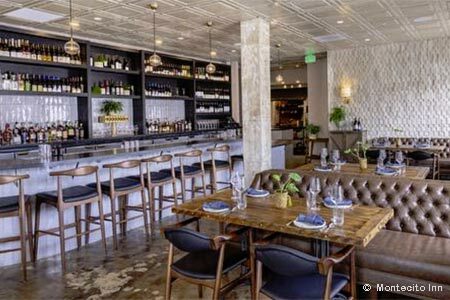 10 a.m.-2:30 p.m.
: Chefs Phillip Frankland Lee and Margarita Kallas Lee of Scratch|Bar & Kitchen oversee the culinary program at Montecito Inn, including The Monarch restaurant. The American menu starts off with flatbreads, handmade pastas and starters of yellowtail crudo, grass-fed rib-eye tartare and more. Main courses, which are served family-style, might feature half roasted chicken, short ribs and white sea bass. Other concepts at the hotel include fine-dining destination The Silver Bough and Chaplin's Martini Bar.